Mary Duke Connell has been swimming since she was a baby, and she has a passion for the water. “In my 15 years as an aquatics director, I’ve seen firsthand what the water can do for people,” she says. “Because aquatic exercise is easy on the joints, it can be effective for athletes during the preseason and regular season, for conditioning before and after surgery, and for gentle relief from injuries and ailments. Mary Duke has a B.A. in Physical Education. She’s been an Aquatics Director for 15 years, and has been with Milestone since the center opened in November of 2000. She and her team have won numerous awards and national recognition. 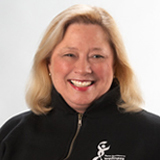 Most days you can find Mary Duke in the aquatics area, and she’ll be glad to help find the right class for you.